Can I feed my dog both raw and kibble? We’re big believers in feeding our pooches a raw diet here at Global Pet Foods New Brunswick, and here in our Saint John store too. And we’re also of the mind that it is better to feed your dog any raw, rather than none. It’s not a good idea to mix raw food and dry kibble in the same meal because dry kibble takes longer to digest and can cause digestive distress when mixed with raw. Also, many dog owners love the idea of feeding raw, but not the cost. 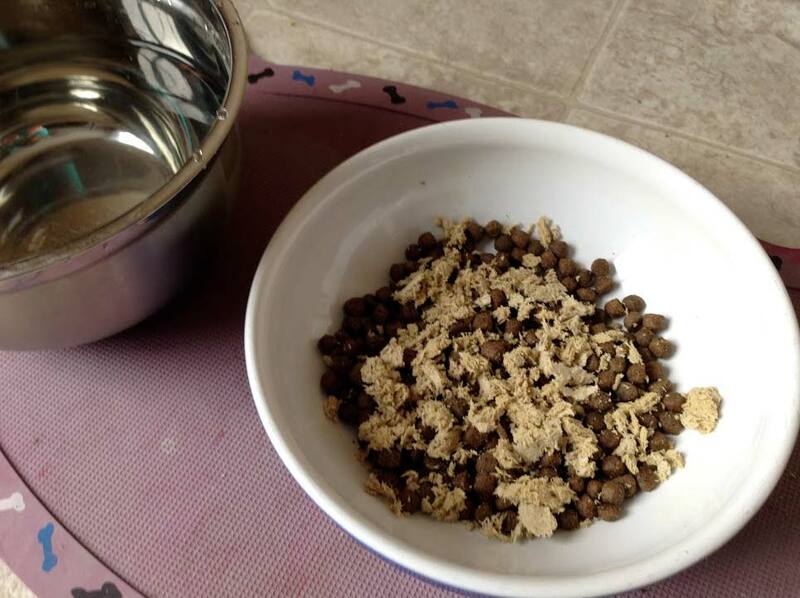 Here’s an easy way to ensure your dog is getting the nutrients she needs, while saving money. What many of us do, is feed our dogs dry kibble in the morning and then a Primal or Instincts raw, thawed patty or slice of frozen mix or grind (chub) in the evening. Just make sure you are giving the same amount of food in the two meals that you would give a day. It’s easy if you just give half the total allowance by body weight in the morning, and half in the evening. Cubed freeze-dried meat, bone, and organs such as from Primal, Stella & Chewies, or Orijen, offer a small bit of raw food that is safe to mix with dry kibble, as long as you don’t moisten it. Simply crumble up a cube directly onto your dog’s food. These are great for the picky eater — most will eat their food right up. Freeze-dried is raw food that is flash frozen to remove the water and the the closest to fresh you can get. A closer to raw experience would be to treat your dog every now and again with a meal of only freeze-dried cubes that are rehydrated with warm water. Follow the instructions on the package and make sure you refrigerate if your dog doesn’t eat it all within 15 minutes. Not that there is likely to be any left! Recreational bones make great tartar-off treats. Try beef or bison marrow bones (perfect for medium and large dogs). Most dogs can’t resist them and while they are using their tongues and teeth to get into the marrow, the bones scrape the tartar off their teeth. Once a week is good for dental maintenance. Serve them frozen and it’s much less messy. Most larger dogs will get through the marrow in one session, but if not, you can put it back into the freezer for another day. After the second chew, or two days out of the freezer, you should throw the bone away whether your dog has eaten all the marrow or not to prevent bad bacteria from upsetting his or her digestion. 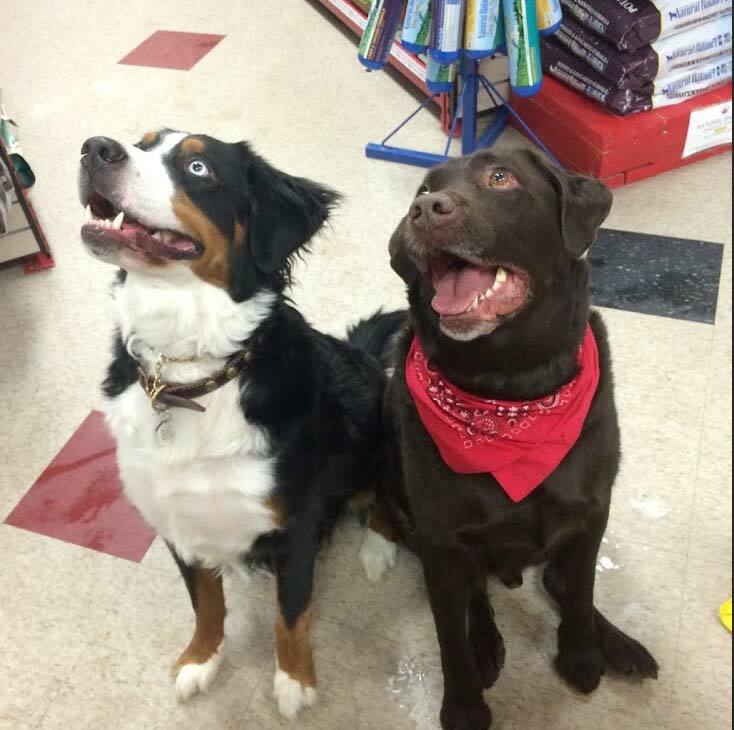 Koda (right) with his fur buddy Murphy, who belongs to staff member Megan McLaughlin. Recreational bones are from load bearing bones of the animal (legs typically) so they are super strong. Just make sure you watch that your dog isn’t trying to eat the whole thing. Some dogs chew so hard they can chip their teeth, so watch for that too. Freeze-dried raw treats like organs (such as liver or lung), chicken and other meats, or sweet potato are delicious. Treat your dog to these healthy treats on a daily basis (they’re healthier than grain-based treats too) and are handy for recall and other training, or even a reward for allowing his nails to be trimmed, or after brushing. With all treats, don’t overdo. It is much kinder to cut back on treats and make them special than to overfeed. “Happiness is a warm puppy” is my motto. I’m Bradley Walsh and I specialize in dog toys and exercise, but I’m happy to handle whatever comes my way. 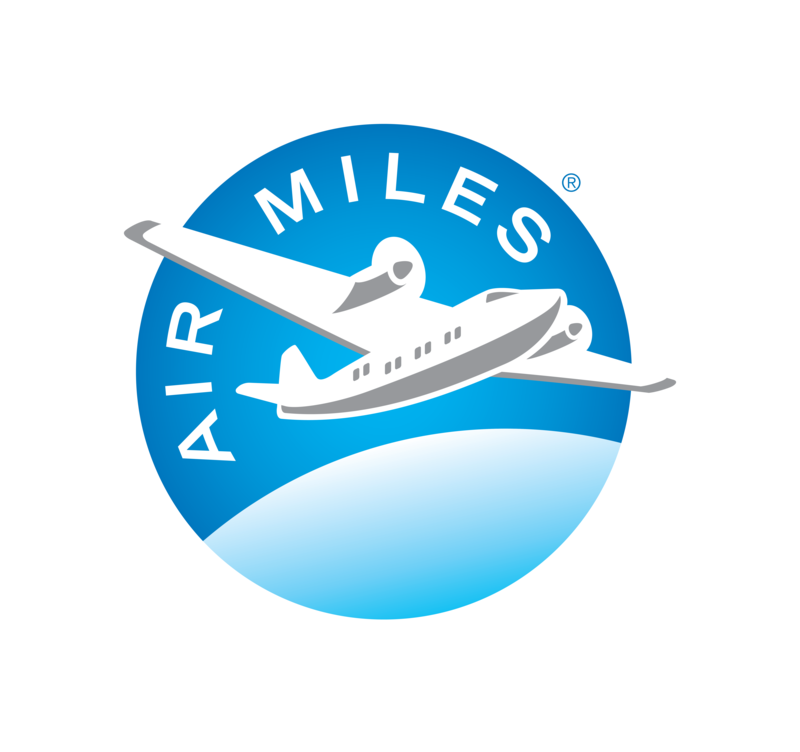 If you have any questions, comments, or suggestions about this blog post, I’d like to hear from you. You can comment below, on facebook, google+, or by tweet to Global Pet Foods New Brunswick using the #GPFBradley to send me a message and I’ll get back to you. You may also see your question answered in another post!